We are proud to congratulate Bridgedale Academy grad Brady Smith, who will start his Division 1 NCAA hockey career next season at Colorado College. 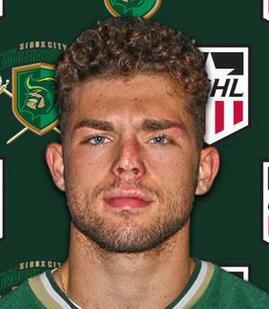 Brady, from Bloomington, IL, is now with the Sioux City Musketeers of the USHL. He is a powerful, smooth skater known for his puck movement and strong shot. Brady recently de-committed from the University of Wisconsin where he'd originally intended to go, committing while still only an 9th grader at Bridgedale. Brady said he is looking forward to being a CC Tiger and starting his college hockey career next fall. "Brady graduated from Bridgedale a few years back and has matured into a wonderful young man," said Bridgedale Academic Dean Christina di Pauli, who also hails from Bloomington. "Colorado College will be an excellent fit for Brady and all of us at Bridgedale are very excited for him and his parents Mitch and Jennie." Congratulations to Brady (and his parents Mitch and Jennie) on his commitment to Colorado College. Bridgedale Academy is an all-boys school for athletes, a prep school for serious youth hockey players. We will offer grades 5 through 8 in the 2018-19 school year. In addition to our winning combination of sports and academics, we focus on leadership training. We use a classical academic curriculum and our graduates go on to attend some of the most prestigious high schools in the midwest, including Lake Forest Academy, Culver Military Academy, Shattuck St. Mary’s, Northwood School, Benet Academy, Fenwick Prep, St. Ignatius Prep, Marmion Academy, Latin School and Providence Catholic. We pride ourselves on being the top youth hockey prep school in the nation. Thirteen (13) of our former or current students have already received their NCAA Division 1 college hockey commitments. Three (3) of our former students competed for USA Hockey’s National Team Development Program. Two (2) will begin their college playing careers in 2018-19 at Notre Dame. Several other Bridgedale grads will be playing junior hockey, including in the OHL, the USHL and the NAHL.